Heather Mitchell, George Shevtsov, Aaron Pedersen and Pauline Whyman in Signs of Life. Photography by Lisa Tomasetti. 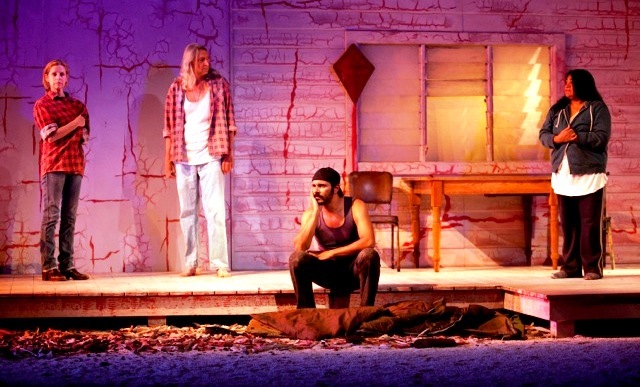 Sydney Theatre Company, Black Swan State Theatre Company and Commonwealth Bank present SIGNS OF LIFE by Tim Winton, in the Drama Theatre, at the Sydney Opera House. Tim Winton is a great, celebrated, Australian novelist. Beginning in 1981 with his inaugural book, AN OPEN SWIMMER, winning the Australian/Vogel Literary Award. He has won an unprecedented four Miles Franklin Awards and nominated twice for the prestigious Man Booker Prize for Fiction (1995 - THE RIDERS; 2002 - DIRT MUSIC). 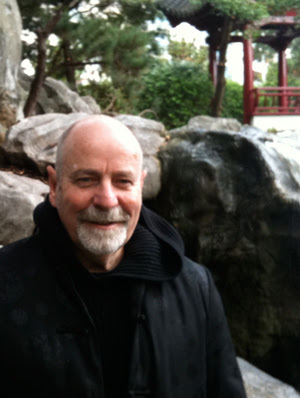 He has had two of his novels adapted, by others, for the theatre : THAT EYE, THE SKY (also, a film) and CLOUDSTREET (also, a television mini-series). SIGNS OF LIFE is the second play that he has written, the first we have seen in Sydney. AFTER RISING WATER (2011), was produced by Black Swan and the Melbourne Theatre Company and seen in Perth and Melbourne. Taking a character, Georgie (Heather Mitchell), from his novel, DIRT MUSIC, Mr Winton continues her story. Georgie, haunted by the ghostly presence of her husband, Lu Fox (George Shevtsov), has the sanctuary of her grieving, the homestead, invaded by an indigenous brother and sister, Bender (Aaron Pedersen) and Mona (Pauline Whyman). All are in search of place, of belonging, perhaps identity. Maybe , here in this landscape they will find it. each of them. The interaction between them, especially Bender and Georgie, is the concern of the play. There is some beautiful writing, and the over all impression is one of a sense of the enormous spirituality of the Australian landscape - a landscape with a dried up river bed reminiscent of a large skeleton of a dinosaur - old in time, in layers and layers of time, waiting to embrace, absorb, this new era of life, these people. Indeed, these characters are floundering for some anchoring identity of belonging, and collectively they may find it in the ancient 'music' of this place, this land. The principal problem, for me, was that the 'pearls' of the short scenes did not have a string of action of continuity, that is necessary for the 'reader' of the play in the theatre. The writer, or the director, Kate Cherry, had not found the way to bring the pieces into a fluid whole of embodied action. The entrance and exit of the characters seemed clumsy, (especially those of Lu - sliding onto the stage through a split in the back drop of the set), and not knitted to the possible musical construction of the play. I thought that the play in the Drama Theatre was on a stage too big for it. Too wide. The setting (Zoe Atkinson) too detailed, too specific visually, and skewed off centre in an uncomfortable staging. The text had the musicality of a string quartet, a chamber orchestra, playing beautiful language, for the listener to endow and imagine. The play is a chamber play and was harmed by the breadth of this theatrical space. The imagery to be invested by the audience to make the play live is in the language, the rhythms in the gaps between the scenes, they needing the same simplicity as the speaking of the poetics. It could almost have the staging simplicity of a radio play. A play for voices (UNDER MILK WOOD?). Listening, (and watching), I had the memories of the great poetics/themes of Eugene O'Neill and some of his plays. The speech, here, of the sea and the great cliffs of the West Australian coast reminded me of the hypnotic magic of Edmund's speeches of his sea voyages from LONG DAY'S JOURNEY INTO NIGHT. The landscape and the characters in SIGNS OF LIFE triggered memories of DESIRE UNDER THE ELMS, of humans stumbling, staggering in a landscape of dirt and dry dust, under the canopy of the stars, echoing the resonant search of the Greek myths of yore, for these Australian indigenous. Tim Winton seems to be searching for the affirmation of a world bigger than the palpable one around us in this play. He is, perhaps, trying to find the spiritual space of the nation, for our times. This is the magnetic pull of his novels and I believe it is here in this play, too, but not in this production. Ms Mitchell gives a great performance, feeling and breathing the scale of Mr Winton's vision, with an ownership of great passion and concentration, body, voice and 'soul' engaged. Aaron Pedersen, too, has intimations of that power, and is physically and vocally convincing, he is best when working with Ms Mitchell - he is, however crippled with a final badly directed moment with a kite, that had a poetic possibility, but is not resolved the way it probably ought to be by the director. It is almost risible, and undercuts the ending of the play, and some of Mr Pedersen's Bender's impact. Ms Whyman has moments of conviction but lacks consistency of truthfulness and Mr Shevtsov's performance as the ghost of Lu Fox does not seem to have a consistency of a reality - is he a spirit or his he alive? - the emotional action and involvement seemed unsuitable for a ghost and confused me. SIGNS OF LIFE has only potential in this production. It is not fully expedited - the possibilities not kinetic at all. I look forward to more theatre work from Tim Winton. P.S. $84, concession (including the 'tax' of $5 taken by the Sydney Opera House Trust to pay to see the Sydney Theatre production in the Drama Theatre, even though I was at the box office in working hours and with cash. If I couldn't pay it, would I be prevented from attending the play? Would the STC lose the income? How do the STC feel about this demand, this 'tax' on attending their work at the Opera House? Do they lose custom?). $3.50 for a coffee before the show. A total of $97.50 for an afternoon matinee. Is it possible for many of us to go to the theatre, at this rate? Certainly this house occupation, audience attendance, may have been only just over half full. I am being positive, here. We will have to discriminate more rigorously about what we see. Others are, it seems. This production was approximately 80 minutes long. More than $1 a minute! What a philistine, I am, eh? But, I do like the theatre, I do. I want to see as much as possible. You're right Kevin. We are having to be careful about what we see because of cost. I for one, working in the Arts as I do, often cannot afford to actually go to the theatre. I remember the days when STC had an artist's register that gave known theatre workers free tickets, something that in turn helped build a community feeling rather than the exclusive feeling that exists today. It was established after a Playwright's Conference at which the playwright Alma De Groen and others spoke passionately of the frustration of being dedicated professionals who could not afford to participate in that very profession. As to the levy on tickets at the SOH, that's just a criminal rip off.